Third single taken out of the album 'Homework'. DJ Sneak Main Mix and the original (of course) are my picks here. You'll never hear a fire drill or fire alarm in the same way again after this track. 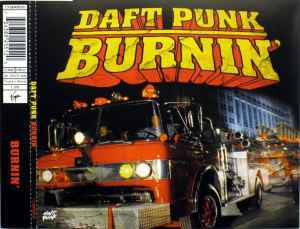 Daft Punk's 1997 release Burnin' is a track that (in my opinion) still stands out today as being one of the best Daft Punk tracks ever made. It is complimented with a killer music video about a Disco Party in a skyscraper that almost gets burned up, but the good ol' firefighters get there and save them all.... very sweet! I highly recommend the track for daft punk fans... It has disco flavour with a screaming analog whipping sound... The sound contrasts and blends at the same time with the discoteque type bass line. Add the funky high hats and snare hits... and you have one unique daft punk track that is still fresh to this day! this one is awesome. techno with a disco flavour.